Get Going for Free, Only Spend Money When You Need To. 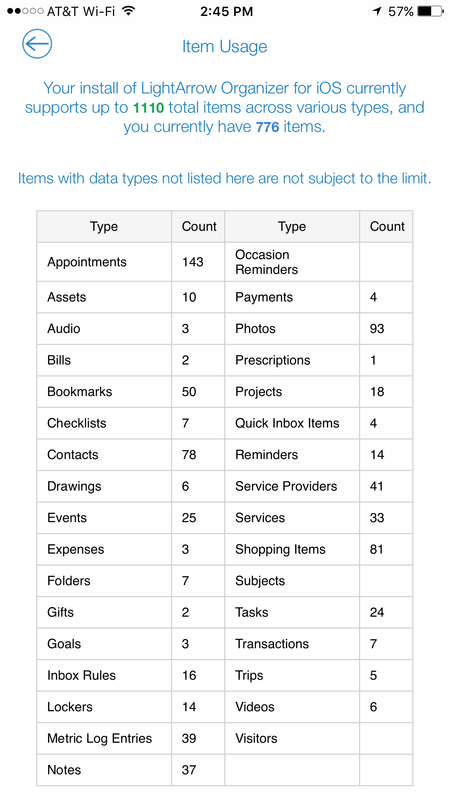 LightArrow Organizer, as a freemium app, comes with a generous 100-item limit for free. That means, you can add up to 100 total items that includes tasks, projects, notes, checklists, contacts, and more. That should give a majority of users pretty far – and be able to try every feature of the product. If you continue to use the app, when you need to raise your item limit, you can buy additional item packs conveniently as in-app-purchases. If you have the app both on the Mac as well as on iOS (iPad, iPhone, iPod touch), you will need to purchase item packs on both platforms as needed, since the App Store is separate on the two platforms. Any purchase on an iPad is available for free on the iPhone since our iOS app is an universal app. For users that use LifeTopix, My.Agenda or Pro.Calendar on iOS do not need LightArrow Organizer on iOS. But when they use LightArrow Organizer on the Mac (which has a 100 item limit), they have to buy item packs on the Mac if they wish to sync with their data on their iOS app. In the latest updates forLifeTopix, My.Agenda and Pro.Calendar, one is able to see how many items you are using in order to determine which item packs you need to purchase on the Mac. The Mac app also ha an Unlimited option. LifeTopix versus LightArrow Organizer on iOS decision for new users: see this. Some “one-time-purchase” apps charge for each platform, full up-front, while all they do is manage tasks, or just contacts. Some apps and online services follow a subscription model with a recurring monthly fee – regardless of how much you use the app! For all the things our app does (Contacts, Calendars, Projects, Assets, Expenses and much more! ), there are apps that charge anywhere from $10–$100, or more – every month! Over a couple of years, each user ends up paying $1000 with those monthly subscriptions. A very active user in our app, over a two-year period, depending on usage style, may need up to 2000-3000 items, ending up spending a tiny fraction compared to a set of monthly subscription apps. We have made the item-pack sizes very flexible to enable users to only buy what they need. The Mac App Store and iOS App Store are totally separate. In-App purchases have to be purchased individually on each platform though the iOS version is a universal app and a single purchase will allow you to install and run on any of your iOS devices. Easily Know What You Use and When to Buy Item Packs.